When firefighters responded to the deadlyfire in a Bronx apartment buildingon Thursday night, they were not only battling flames — they were also fighting the effects of the frigid cold. Temperatures were in the teens Thursday as 170 firefighters spent more than two hours taming the fire, which killed 12 people, including five children. Water from their hoses froze on the street. Dispatchers could be heard over FDNY audio telling firefighters to stay in their rigs to keep warm, NBC New York reported. While every fire poses grave challenges, blazes in the cold months of winter create extra concerns for firefighters, experts say — including hypothermia, frozen equipment and gear, and even how long it takes to notice the fire in the first place. "The dilemma that you run into in cold weather is everyone has their houses shut up tight, so the discovery of the fire, if it's not by the person living in the home, then the chances of someone outside seeing it are still okay. But it's going to take a little longer because everything is closed up," said Greg Cade, a former firefighter of 50 years who is now the mid-Atlantic regional director for the non-profit National Fire Protection Association. Once firefighters get to the fire, preventing hypothermia means cycling through crews more quickly so no one is out in the cold for a prolonged period of time. Firefighters' gear is built for heat exposure, not chilly weather; in extremely low temperatures, their command officers need to rotate them out sooner, Cade said. Concern over hypothermia is also an issue for survivors. Witnesses to the Bronx fire said they saw kids without jackets standing on the building's fire escape as they awaited rescue in the chilly weather. And then there's the water doused on the fire, which often freezes everything it touches "instantaneously," Cade said, including firefighters' gloves and gear. "It has a tendency to freeze your hose to the ground. I have, more than once, had to leave my hose and in some cases, my truck" and return with massive heaters, he said. The president of the FDNY union the Uniformed Firefighters Association said in a statement Friday that "last night's deadly fire in the Bronx was a horrific tragedy," and that "firefighters feel bad any time a life is lost during an emergency, especially during the holiday season." Union president Gerard Fitzgerald said in the statement that with the freezing temperatures some firefighters were instructed by dispatchers to huddle with their crews to keep warm but that due to the quick response of firefighters dozens of lives were saved. "Unfortunately, there were 12 lives that were lost and our thoughts and prayers are with the victims and their families," Fitzgerald said. House fires are more common in wintertime as the need for heat and alternate heat sources increases, according to the Federal Emergency Management Agency. 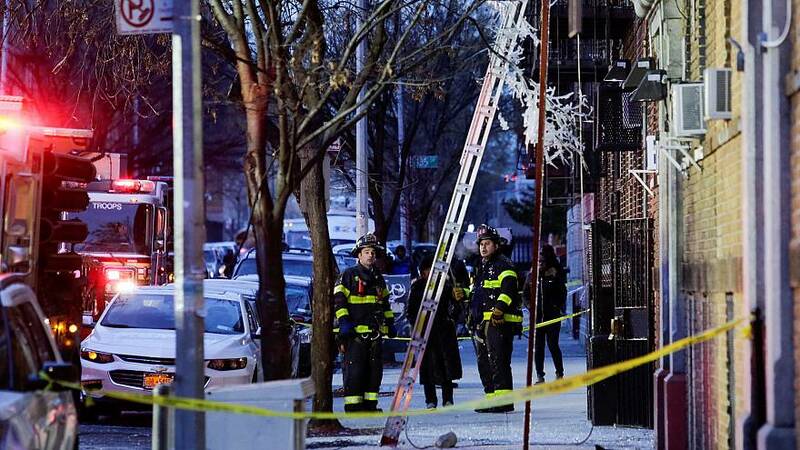 Officials say the Bronx fire was not started by a heat source, but by a child playing with a stove.